Ready for summer! By July this space will look like a jungle! What a season 2012 is turning out to be! 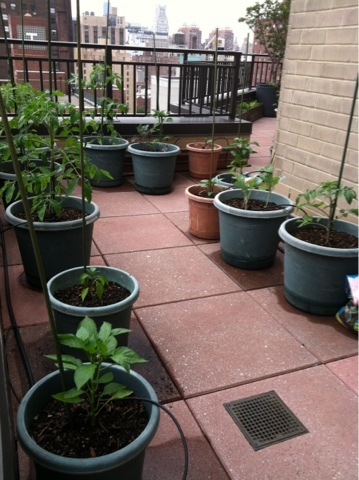 By Memorial Day we had all of our crops in their pots, ready to bask in the sun. The warm spring inspired us to get our seedlings started early. We're already reaping rewards. 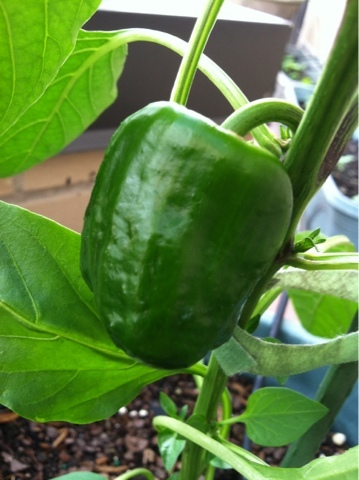 Our tomato and green pepper plants are sprouting fruit well ahead of their usual patterns, the cucumber vines are looking mighty healthy and the lettuce is going strong. We could be harvesting tomatoes come July. 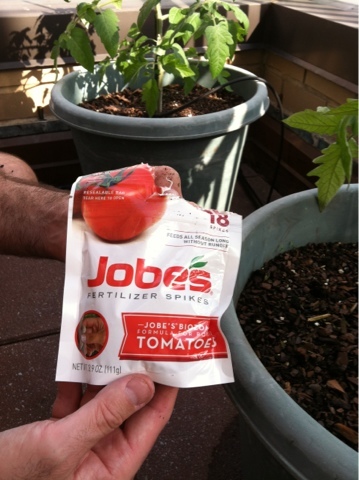 Speaking of tomatoes, we've added Jobe's Fertilizer Spikes to the pots. 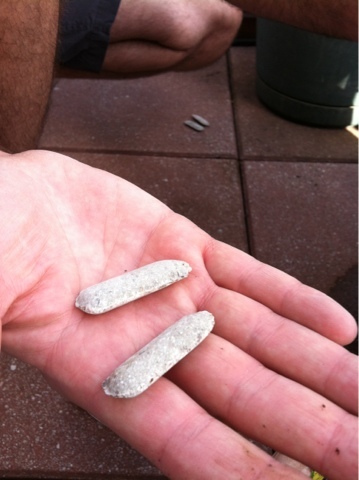 Buried in the soil, the sticks offer the proper mix of nutrients (a three to one ratio of phosphorous to nitrogen and potassium,) last for six weeks, and help the plants absorb calcium. The point is to avoid the dreaded blossom-end rot, a black, leathery scourge that often shows up on the blossom end of the fruit early in the season and renders it inedible. Another trick is keeping the plants consistently watered. We may try mulching so the soil doesn't dry out in the heat. We've added the spikes to our pepper plants as well. Next challenge: getting rid of the aphids on our eggplants!